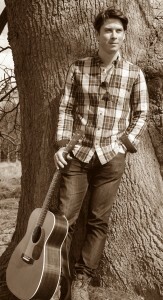 Danny Leigh will be bringing his Folk to the Festival for the first time! Brabourne based Danny Leigh gives us a fresh interpretation of English Folk with a rustic, retro, smooth and emotive quality. A local music teacher in various Ashford and surrounding area schools, Danny couldn’t stress how ‘important it is for children to be exposed to live music’ And his debut performance at this year’s festival gives him the opportunity for his music to reach out through the town. You may have caught Danny performing at the Five Bells pub in Brabourne or the Woolpack in Warehorn, showcasing his hypnotizing folk voice and amazing guitar ability. The festival is very much looking forward to Danny debuting this year! While on a promotional photo shoot with Danny he discussed his debut six track EP ‘Velvet Eyes’ which was released in 2010, and the following year his single ‘Unspoken Words’ and on the 28th June 2013 his second EP ‘Leaning Tree’. 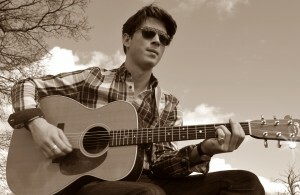 His recordings have been featured on BBC Introducing: The South, Amazing Radio and Kane FM. Danny’s song ‘No More Running’ was included on the 30:30 Compilation CD, released by Roundhouse Records, Chalk Farm and he has supported touring artists: Leddra Chapman, Ethan Ash, Michael Baker, Jazz Morley and Harry Pane. Danny currently hosts and organises a monthly resident night called The Acoustic Folk Highway at The Harrison, Kings Cross. He has taken this music night on tour to Cornwall and to The Banjo Budda Stage at Mandrea Music Festival, Lake Garda, Italy in 2015.